Mayor Frank G. Jackson invites Cleveland residents to participate in an “E.P.I.C. Night Out!” on August 3, 2010. This year marks the 27th Annual “Night Out Against Crime” and the 22nd year that the City of Cleveland has hosted the “Mayor’s Night Out Against Crime” as an opportunity to encourage Clevelanders to come together and take an E.P.I.C. (Enforcement, Prevention, Intervention and Community) stand in the fight against crime. Events will be held throughout the city featuring police and public safety vehicles, free health screenings, refreshments and activities for the entire family! 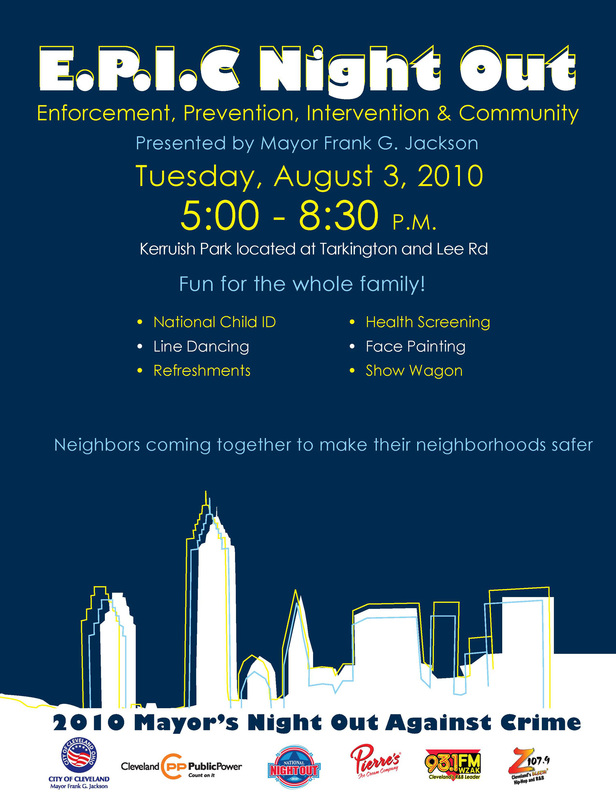 We hope to see you at the Mayor’s main event from 5:00 pm – 8:30 pm at Kerruish Park on Tarkington Ave. and Lee Rd. or any of the locations near you. For more information, call 216-664-3290. Night Out Against Crime events are sponsored by Cleveland Public Power (CPP) and the City of Cleveland Community Relations Board.